An overnight snow storm has paused our impending Spring rebirth. Beneath the snow covered ground, glimpses of green growth remind us of the 70 degree temperatures that blessed us only days ago. A mere pause in the launch of Spring. Or is it really a pause? 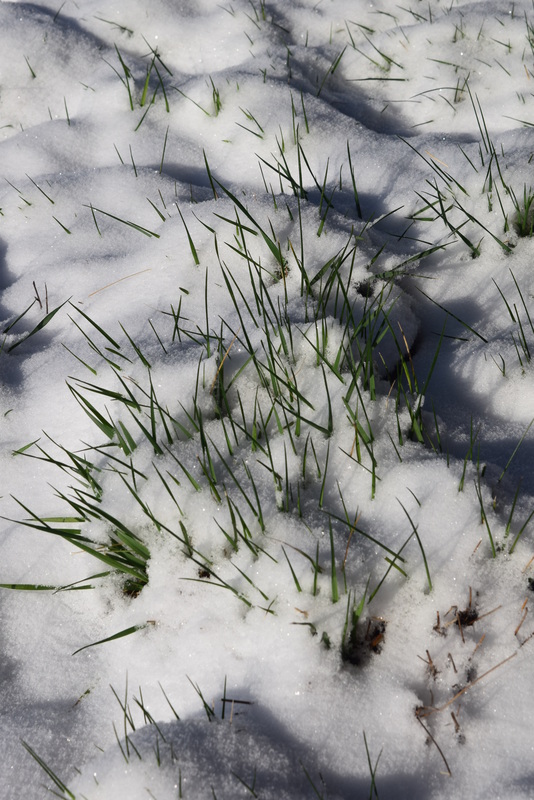 The moisture of the snow is welcomed by our dry earth and will only accelerate Spring’s awakening. It’s the spiraling evolution of nature’s cyclical journey. Spring is my favorite time of the year. The rapid transition from brown to green bringing the dormant life of winter into fully blossoming colorful expression, is reflected in my own soul. Ready for warmer days, meandering walks in nature and the songs of returning birds, Spring abundantly awakens my body, mind and spirit. I marvel at how in sync we can be to the natural wonders of the world. And I am thankful for the quieter pause of winter that proceeds the busier pace of Spring. The rhythm and pace of our life journey sometimes provides pause – a natural slowing creates space for deeper thought and contemplation, and the birthing of new ideas. If we nourish those ideas with curiosity and care, innovation springs forth, likely followed by an accelerated spiral of new possibilities. In awe, I honor three of my clients’ journeys this week – as they have found this accelerated spiral of new possibilities. They stepped into major life breakthroughs and transformations in the dawning of this first week of Spring. In each case, it didn’t come easy. Their big ideas evolved through a lifetime of experiences. Sometimes difficult, sticky, bumpy life experiences. And in the midst of the imploding noise, they slowed down and took pause. They sought meaning in their life stories. They paused in deep reflection of the callings they were hearing and reconnected to their very essence of who they are. They considered what they want to stand for and how they want to matter. It took courage and intuitive trust that there might be another way. Each had to live in the realm of curiosity and explore their many “what ifs.” This reflection brought more pause in their journey. And like the birthing of Spring, seeds took root. With clarity, these three brilliant women weeded the ideas that didn’t quite fit, making space for the right ideas to birth. Bravely giving voice to these new possibilities, the spiral of opportunity opened, supported by a spring fold of happenings that reinforced that, indeed, they were on the right path. It’s exciting to witness and experience these purpose-driven journeys in action. To experience them all in one week, is a true gift that bears reflection. What I have learned is that no path is a direct path. There are ebbs and flows in the rhythm. Sometimes the pace is slower and sometimes we move at a breakneck speed. And it is always exactly as it should be. Even when you’re in the midst of the pain and discord, life is providing you with experiences that will shape your future – if only you stop to tune in and become aware. Embrace the Pause. Take time for you. Ask yourself inspiring questions that lead way to reflection. What are you learning right now – about you? About your life? What would your 70 year old self tell you today? What makes your heart skip and jump? The gifts begin to flow the moment you ask the question. Trust in Your Path. Trust that you’re in exactly the place you are meant to be on your journey. Even if you are having a series of continuous Groundhog Days occurring in your life, consider what lesson you’re supposed to be learning right now – what life lessons are you missing? What are the missteps that you keep making? Is there a pattern that needs reset? Or perhaps, it’s merely a pause for you to grow and evolve into your next Spring of life. In any case, explore the meaning. Grow, and your path will shift and move. There is meaning and reason for where you are today. Know Yourself. And I mean who you are at your very core. The person that has evolved from childlike wonder to the person you are today. You’re not a job title. You’re a lifetime of experiences that has shaped you. You’re rich full of talents that are meant to make a difference in this world. Live into that gift. Choose an Abundant mindset. The energetic blockage that scarcity thinking brings to your journey will only attract more scarcity. If you’re feeling stuck, chances are you are feeding the scarcity wall in your life. Stop! Make a conscious choice to breathe life into abundant possibilities. Give thanks every day for the abundance in your life. Get inspiration. Spend time with people who help you grow and expand. Read books that uplift you and push your thinking beyond the place it is today. Take a walk in nature and reflect how Mother Nature’s journey can be reflected in your own journey. Spend time with a child and relish the world through a child’s eyes. Experience life full out. Be furiously passionate about how you spend your time. Don’t let a mundane life of electronic screens dull your senses to the wonder of our world. Find adventures – whatever your adventures look like. Laugh. Spend time with your best friends. Shine your light onto the world. We want to experience you in all your glory! Engage your courage. A purpose-driven life takes courage. It takes stepping into spaces you never thought you’d go. When you step out on the edge of your comfort zone, and move beyond, just small step, by small step, you grow. You open doors to possibilities that never would have surfaced if you stayed small. You will thrive in your gifts. As I close out this week with joy for the breakthroughs these courageous three have made in their journey just this week, I ponder what breakthroughs will be in store next week? As I consider the possibilities amongst the many brilliant women gracing my client list, I know more are in works. I smile, relishing in my own spiraling journey of life – and I’m grateful. Grateful that I can share in their journeys. Grateful for my own life lessons that unfold alongside their journeys. Grateful for the abundance in my life. Grateful for the dawning of Spring and the new birth that comes with it. May your world be filled with as many wonders. Want some help mastering the art of your life journey? Grab one of my limited Yes-to-You Strategy Sessions and we’ll plant the seeds of the life before you.